LIMEX is a new material created in Japan using limestone that has been garnering attention worldwide. Limestone is found in many regions around the world. LIMEX has a small environmental footprint, and even nations without trees or water can use it to produce both paper and plastic substitutes, which is a prime reason this useful technology is rapidly spreading globally. Microplastic contamination of the sea has recently become a major environmental issue. Several nations and businesses have stopped using straws and shopping bags at supermarkets, which has created a need for an environmentally friendly material to replace plastic. This is one of the major reasons LIMEX has been gaining attention. Using limestone as its primary raw material, LIMEX is a durable substitute for plastic and paper, and can be made without using wood or water. 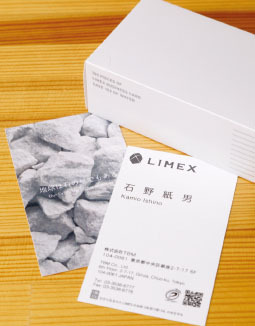 Products made using LIMEX include business cards, pamphlets and other paper products, as well as plastic products such as storage containers and file folders. Over three thousand businesses throughout Japan are using it. TBM Co., Ltd. the company that created LIMEX, has been gaining attention worldwide. Out of over ten thousand businesses promoting corporate social responsibility (CSR) TBM was nominated as a partner at the Brussels SDG Summit in 2018, operated by CSR Europe. During the summit, the pamphlets used for the event were made from LIMEX. 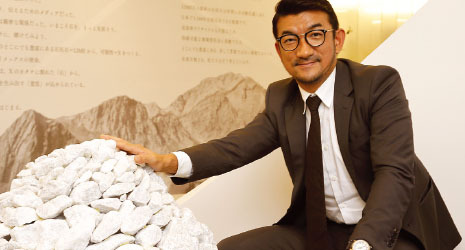 Nobuyoshi Yamasaki, founder and CEO of TBM, first learned about the potential of limestone when he came across “stone paper” ten years ago in Taiwan. The limestone needed to make LIMEX is inexpensive and can be found throughout the world. Even in Japan, which has limited natural resources, there is enough limestone to cover the nation’s needs completely. While LIMEX is currently made using 20 to 40 percent petroleum-based resin with the rest limestone, TBM is developing a process that uses products like corn to make LIMEX a biodegradable substance. The paper-like version of LIMEX is made using porous sheets that match the light quality of paper, while also being waterproof and more durable than wood-based paper. LIMEX also has the advantage of being easy to recycle. 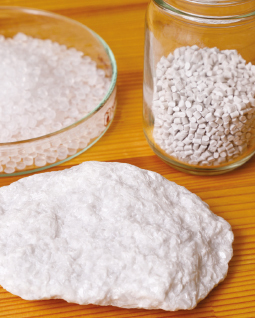 Printed LIMEX sheets and its byproducts can be collected and remanufactured into plastic alternatives by using processes such as extrusion molding. TBM obtained a domestic patent for LIMEX in 2014, and also applied for a basic patent in over forty other countries, twenty of which have been registered so far. TBM intends to both sell LIMEX as a product and export the technology to the world. LIMEX is spreading rapidly, and in December 2018 TBM representatives attended the Conference of the Parties to the United Nations Framework Convention on Climate Change held in Poland. As part of the Japan pavilion, they gave a presentation regarding the potential for decarbonization using LIMEX. The possibilities of LIMEX promise to grow on a global level.